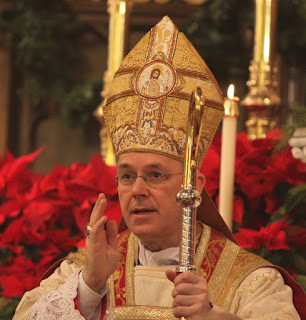 As part of its 10th anniversary celebration of Summorum Pontificum, St Mary’s Church in Norwalk, Connecticut, has partnered with the St Hugh of Cluny Society to invite Bishop Athanasius Schneider for a conference and Pontifical High Mass at the faldstool on Thursday, October 19. The Schola Cantorum of St. Mary’s Church, under the direction of David Hughes and Charles Weaver, will sing the Votive Mass of the Blessed Sacrament. Bishop Schneider is making his second visit to Norwalk, first celebrating a Pontifical Mass in January 2013. He and Fr. Innocent Smith, O.P, will each have a presentation, beginning at 5:30 in the school hall, followed by the Mass at 7:30. A reception follows. No registration is required for the conference, but a free-will offering will be accepted.